Friday equals Fish Day! My local grocery store’s Fish Dept. will be quite busy today! Yesterday, as I was glancing through the new sales flyer from Big Y, “Fresh Wild Caught Sea Scallops” are featured. An extra temptation in purchasing Sea Scallops is the added fact that when using a Silver Coin the result will be an additional $2 discount. So, today’s dinner includes Pan Seared Scallops! Sweet! For so many years the decision of what will be on our dinner table has been made around the Sales for the week at my grocery store. Unless, of course, there is a special occasion. Coupons and Specials are the way to shop. It has always been a way of life learned from my own childhood. This afternoon the Sea Scallops will be purchased and dinner will be prepared quickly and easily! 1 lb. Sea Scallops (can be about 10 large ones) I request the larger Scallops. 1. Combine all dry ingredients in a Ziploc Bag or small bowl. 2. 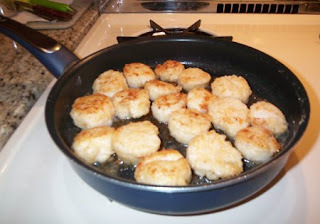 Rinse Scallops in cold water by placing in a bowl, rinse & drain. 3. Coat Scallops in Flour mixture and place on a plate. 4. Put Olive Oil in a skillet or a saute pan. Then turn heat to medium/high heat. (I use a non-stick pan.) Heat until hot but not quite smoking. Take pan off heat and add the Scallops to the pan. Place back on heat and cook Scallops for 2½ minutes on the first side. 5. Then, if needed, add the additional Olive Oil in the pan. 6. Turn the Scallops over and continue to cook for about 2½ minutes on the second side, or until golden brown and just cooked through. 7. Remove one Scallop from pan, cut with a knife and see if done. If not, then saute all for another 30 seconds. In our fridge is some remaining Cole Slaw. Yams will be placed in our Microwave. This makes for a scrumptious dinner! The Yams will be washed, cut into about 1/2" slices, and poked with a fork. Then, the slices of Yams will be placed in the rose colored 8” Pyrex Baking Dish. After adding 2 TBS. Water, cover with Glad Wrap, leaving one corner 1/2" open. Microwave about 6 Minutes on High, rotating the Baking Dish once. The total time depends on the individual Microwave Oven. For me, baking the Yams in the oven results in dry veggies. For that reason I always use the Microwave for Yams. We always enjoy this tasty, colorful dinner! Do you like Sea Scallops? We will enjoy dinner tonight! Tomorrow, we will enjoy Haddock Plan B for Dinner. 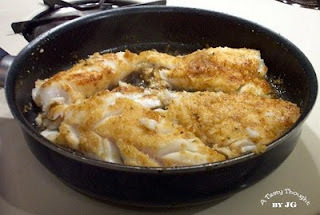 Last summer after preparing the Haddock fillets to be placed on the grill, my Hubby came back into our kitchen to inform me that our gas grill was “unavailable” to use. Now, that was not good and my facial expression certainly expressed my shock. The potatoes were in the microwave ready for the “Start” button and two Veggie Salads were in the fridge. So, I pulled out my 4C Flavored Bread Crumbs. I am not in the habit of using too many eggs while cooking; it’s that cholesterol thing. The Haddock had already been coated in Olive Oil, and it was sure easy to bread. Plan B required breading the fillets and then sauteing them in Olive Oil. Now, this fish dinner is enjoyed quite often whenever our grill is not in use during these winter months. It’s quick and it’s easy! And it sure tastes yummy! Have you ever tried it? Tomorrow, the fillets will be purchased and dinner will be quick and easy. Oh, yes, the “Microwaved" Baked Potatoes and Mom’s Cole Slaw will round out our meal. 1. Place about 2 TBS. Olive Oil in shallow pan or large dish. 2. Sprinkle about 1/8 tsp. Paprika over Olive Oil. 3. In a Gallon size Ziploc Bag or baking dish place 1 Cup Seasoned Bread Crumbs. 4. Rinse fish in cold running water. 5. Dip each side of fillet in Olive Oil. 6. Bread each side with Bread Crumbs. 7. Heat about 2 TBS. Olive Oil in a large skillet over Medium heat. 8. Sautee each side of the fish for about 5 Minutes or until fish is flaky. Do you use your Slow Cooker/Crock Pot often? I sure do! 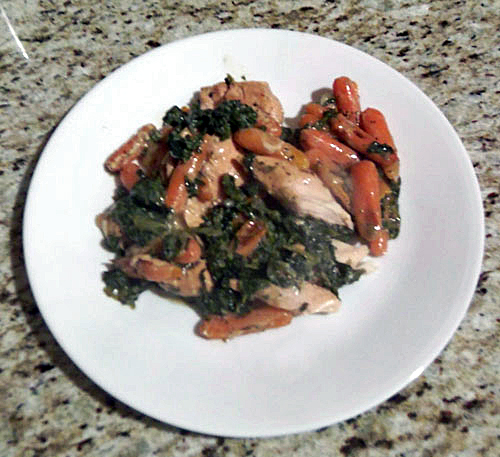 Yesterday afternoon, Chicken Florentine a la Slow Cooker bubbled away in my West Bend Slow Cooker and smelled so good! The Veggies and Chicken Tenders tasted great after simmering for a period of time in my Cookers’ Pot. This meal was so easy to prepare. It took about 15 minutes to place all of the ingredients in the cooking pot. That was an added plus! Sometimes when making this meal, I cut two Potatoes into chunks and add the chunks. Other times like yesterday, a bag of Baby Carrots is added. Baby Carrots are usually on my grocery list, so a bag is typically located on the bottom shelf of my fridge. 1. Rinse (1) 16 oz. Bag Baby Carrots in cold water. 2. Place Carrots in Slow Cooker’s cooking pot that has been lightly sprayed with PAM. 3. Add (2) Bay Leaves. 4. Rinse and then place about 1 & ½ lbs. Chicken Tenders on top. 5. Spread (1) 10 oz. pkg. defrosted frozen Spinach on top. 6. Then, sprinkle on about ¼ tsp. 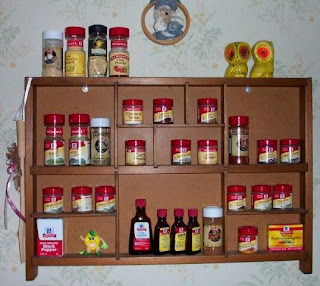 Oregano, ¼ tsp. Basil, ¼ tsp. Garlic Powder, 1 tsp. Parsley & 1 tsp. Chopped Onion. 7. Mix 1/3 Cup Water with (1) Can Cream of Mushroom (Healthy Request) Soup in small bowl. Spread evenly over top. 8. Place lid on top of the cooking pot and set temperature. 9. Cook on #5 (High) – 1 Hour. Then reduce to #3 for 2 Hours.10. Enjoy!!! 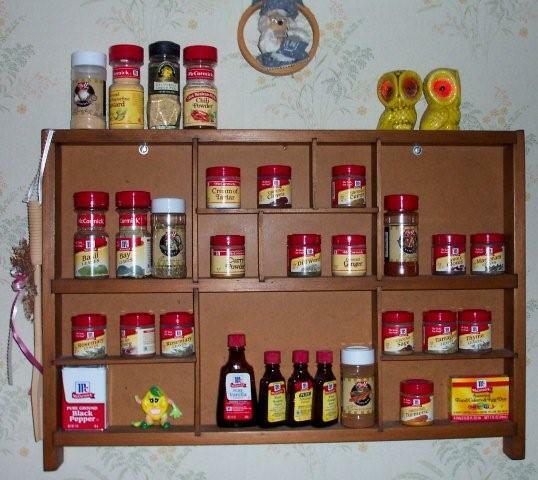 *I use dried herbs/spices from my Spice Rack. This made for an absolutely delicious, colorful dinner. Ah, Yes! Yummy Blueberry Muffins! Yesterday, I took a bag of frozen Blueberries out of our freezer and placed them in our fridge to defrost. Those bags of Blueberries that were packaged in the summer sure come in handy! 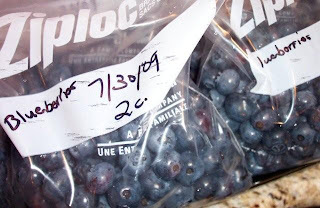 Purchasing fresh berries in the grocery store is an option, but it’s great to just walk downstairs, open the freezer and locate a Ziploc Freezer bag of Blueberries to use when needed. 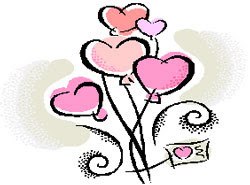 Valentine’s Day is approaching and I need to start thinking about tasty treats. A goodie that can be enjoyed at Breakfast and also just because… Yummy Blueberry Muffins are light and tasty. This is my favorite Blueberry Muffin recipe (click here for recipe card). I use one Egg plus two Egg Whites and also Soy Milk when preparing them. Twenty-two muffins are usually the result of baking one batch. These Blueberry treats taste even better the day after they are baked. That is, if we can wait that long before eating any. They also freeze well! No, we will not wait until Sunday to enjoy them! Yummy! 3. In large bowl cream butter/margarine with sugar until light. 4. Add Egg + Whites one at a time, beating well after each addition. 5. Add Baking Powder, Salt, Cinnamon and ½ the flour. Beat. 6. Add ½ of Milk, beat. 7. Then add remaining Flour, beat. 8. Add remainder of Milk. Beat. 9. Gently add Blueberries, stir in by hand with spatula or spoon. 10. Fill muffin cups ¾ full. 11. Bake 26 Minutes or until muffins are slightly browned. Are you baking any special treats? Shredded Pork Rolls – Yum! After having a yearn for and then making Cole Slaw, it brought back memories. A few years ago my family stopped in The Village Smokehouse in Brookline, MA (near Boston). My sons had Pulled Pork Sandwiches and Cole Slaw. Pulled Pork was new to me and it looked so good served on a bun. The aroma was great! After returning home I located a recipe on-line that Sara Moulton had presented on her cooking show. Now, Sara Moulton has introduced me to some good recipes! After making her Shredded Pork I knew that I would surprise my sons! The next time my younger son was home for a mini vacation, I made Sara’s recipe. On the afternoon he headed back to the city, we had Shredded Pork topped with a dollop of Sour Cream on a Water Roll. It was easy and it tasted so good before we got in our car and headed south for the train station. This became a tradition - the best! 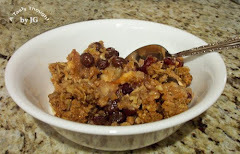 Below is Sara Moulton’s recipe that my family has enjoyed now for many years. I use Garlic Powder and Dehydrated Onions, so I combine Step #1 and Step #2 and omit the Olive Oil. 1. Cook onion and garlic in oil in a 3 to 4-quart heavy pot over moderate heat, stirring, until golden, about 8 minutes. 2. Stir in remaining ingredients except pork, and simmer, covered, 10 minutes. 3. Add pork and simmer, covered, turning occasionally, until tender, about 45 minutes. 4. Transfer pork with tongs to a cutting board. 5. When pork is cool enough to handle, shred lengthwise with your fingers or 2 forks and add to sauce. Simmer, stirring, just until pork is heated through. 6. Serve on a Water Roll topped with Sour Cream. Have you ever tried it? When everything is in the pot simmering, your kitchen will smell so good! An extra napkin or two is needed, but it is worth it! We will be enjoying this before the Super Bowl! I already made the Cole Slaw! Cole Slaw! The Cole Slaw with the Raisins, please! 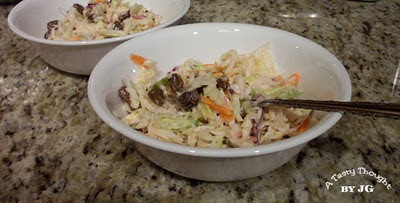 Ah, Raisins give Cole Slaw that extra bit of sweetness to a tangy dressing. Earlier this week I pulled out a recipe that my mother-in-law gave me three decades ago. How time does fly by! And I thought this week zipped by quickly. My Hubby ate this salad often while growing up. After locating and purchasing a 1 lb. bag of Cole Slaw at my local grocery store produce department, I was ready. The Cabbage, Carrots and Red Cabbage were pre-cut and ready to use. Raisins, Mayonnaise, Sugar, Milk and Vinegar are staples in my kitchen, so it was a matter of mixing the Dressing Ingredients and pouring them over the Veggies and Raisins. It’s easy. It’s quick. The result is just outstanding! Yummy! 1. In a large bowl combine Cole Slaw Veggies and Raisins. 2. In a small bowl combine Dressing Ingredients. 3. Pour Dressing over Veggies/Raisin Combo. 4. Stir well, cover and refrigerate. 5. After 2 - 3 hours stir again, then refrigerate. 7. Before serving, stir once again. Sometimes, I prepare it one day before we enjoy this tangy, colorful, flavorful salad. It’s a great side dish for any gathering! Does your family enjoy Cole Slaw? I’ll be making more this weekend!